At Taylor Made Furniture our passion is High Quality, Handmade, Solid Wood, Modern Furniture. Custom Made right here in our shop at the corner of Highway 14 and Range Road 3070, Saskatoon, Saskatchewan Canada. We specialize in designing and building Life Time, Solid Wood Dining Room Tables, Chairs, Sideboards and Buffet/Hutches etc. 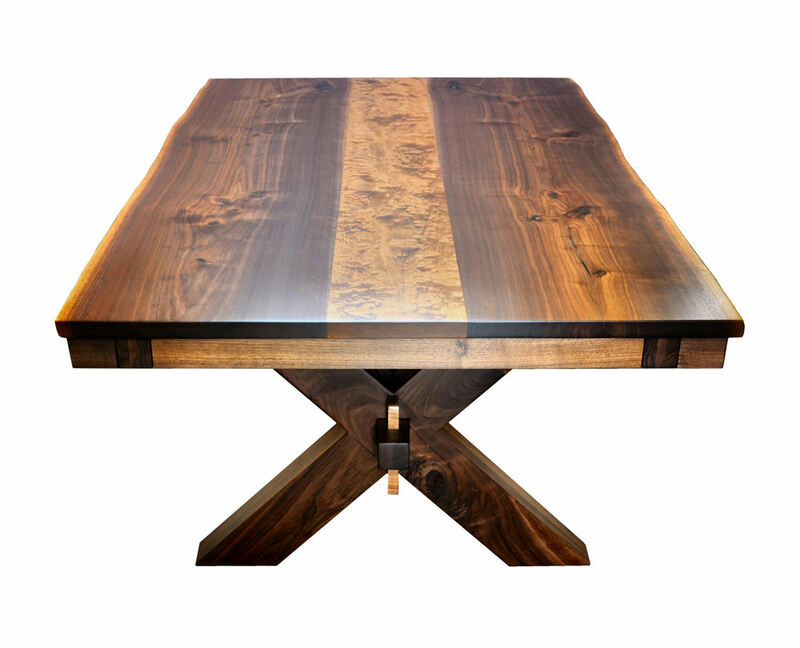 Our Solid Wood Dining Tables are unique, one of a kind, functional works of art. Made right here from scratch to your size, colour and style. Straight and Live Edge Tables made with many different species of high quality Hardwood Lumber from around the world. Woods like Walnut, Cherry, Maple and Oak and exotic woods like Ebony, Wenge, Bubinga and Sapele Mahogany. 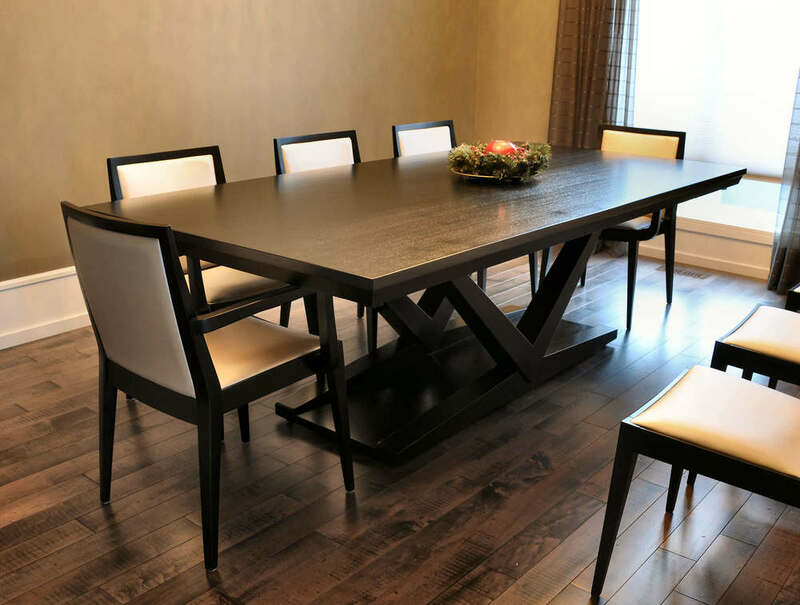 Our Solid Wood Dining Chairs are either Custom Handmade by us or you can choose from over 100 styles of Amish or European Modern style chairs. Chairs that we bring in from only Canadian suppliers. We bring them in unfinished so that we can stain and Lacquer them to match our Tables or what ever colour you like. Our Solid Wood Buffets, Sideboards etc. are all custom made right here in our shop using Solid Wood for all parts including tops, bottoms, sides, doors and drawer boxes. This is not common practice in the furniture industry today. Many who say their furniture is solid wood are not being completely honest or simply just do not know how its made. The vast majority of cabinets in Saskatoon Furniture Stores or anywhere else for that matter are at best, veneers over particle board or at worst have no real wood at all. Our belief is that the furniture we have in your homes should be unique to our own personal style and something we love to see and use everyday and be proud to own for generations to come. We feel this is especially true for our Kitchen and Dining Room Tables. After all we spend the most important days of our lives with the people we love around the Family table. We are going into our 25th year of making furniture. We have literally made and sold thousands of pieces of Furniture in those years most of which have been bought by local families from Saskatoon and other parts of Saskatchewan and Canada but we will ship to where ever you may be. If you happen to be nearby , please come and see the showroom in our workshop, we have many Tables, Chairs, Cabinets and other Furniture pieces on display. Everyone's Welcome. Sale! - Expanding Live Edge, "Vesta Leg" or "Vesta Pedestal Table" - Anniversary offer!